Inventory We are a resale marketplace, not a box office or venue. Ticket prices may exceed face value. This site is not owned by CHI Health Center . CHI Health Center Omaha is an arena and convention center facility in the North Downtown neighborhood in Omaha, Nebraska. The 1.1 million ft facility has an 18,300-seat arena, a 194,000-ft exhibition hall and 62,000 ft of meeting space. The arena hosts various basketball games, hockey games, professional wrestling events and concerts. Another notable event held there is the annual shareholders meeting of Omaha-based conglomerate Berkshire Hathaway. 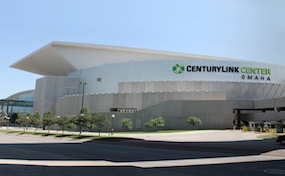 Other names for the facility are "The CenturyLink", "The Riverfront Center", "The Omaha Convention Center and Arena". A major feature of the CHI Health Center is its size. A six-story building can fit inside the space enclosed by the center. The flexibility of the center is impressive as well. The arena can host concerts, swimming, tennis, basketball, hockey, rodeos, motocross, circuses, volleyball (on both a hard and sand court), and has the capability to host many more. The more than capable staff can change the arena from a basketball court to a hockey rink in less than an hour and a half. CenterOmaha.com is a privately held company that specializes in the sale of tickets in the secondary market. We are not affiliated with any official supplier or box office. To purchase tickets to any CHI Health Center in Omaha events simply call our operators at anytime or click on the event you wish to attend.